We’ve all seen Captchas before. They are used on websites to make sure that the person on the website is a real human, not a computer program. Why do we want to break them? The same reason we want to climb Mount Everest, it’s There! The above is the captcha we intended to solve. Its not particularly difficult, but this class is an introduction to wavelets and requires no previous experience with the language we had to use: Mathematica. Our real task was to implement the algorithm in this paper. So how do we do it? First we need to isolate the image without the background. No problem. The color of the text is different from the background so it is easy to isolate. Next we need to take those pieces of the matrix and turn them into a list of coordinate pairs. Then we can apply a rotation matrix transform to undo the angle. What angle? Well I don’t know. 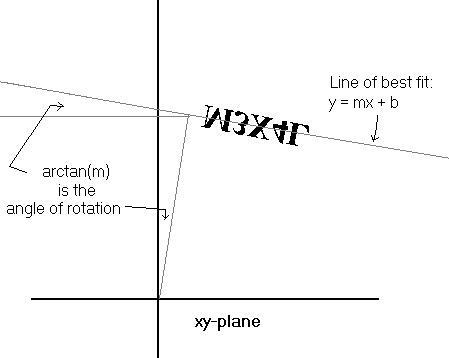 How can we figure out how much it was rotate? Of course! Linear regression from Statistics! No problem! Well actually this isn’t as easy as it sounds. Arbitrary image rotation is non trivial. But let us press on. Now we must Cut the image into its component letters. This is easy, the columns of the matrix that are all white are the demarcation points. Eh so that is a crappy example. When you take two letters and subtract them, you get all black where they are the same, and some white or gray where the “differences” are (Math terms=2 dimensional norm). The letter with the least difference is most likely to be the original letter. The part we want is in the upper most left hand corner, the “blur”. 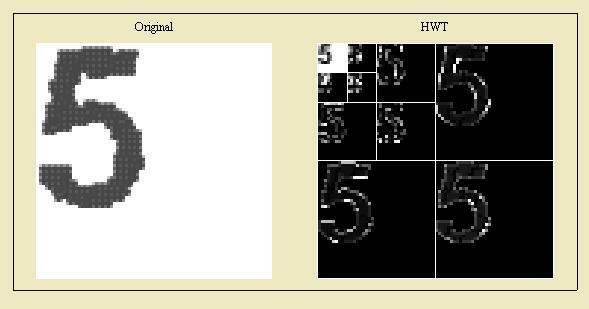 It turns out that 3 iterations of the HWT gives the best results. By doing this we were able to decode our CAPTCHAs 75% of the time. In the end the major flaws take place in the linear regression and the align function. If we used Mathematica 7 instead of 6 we could have used its built in image processing functions to take the error out of our sloppy rounding. Mathematica Notebook To use this you need the Discrete Wavelets Package. Mathematica 7 comes with a function but this is written for 6. Notebook for Mathematica Player Not everyone has Mathematica, but their player is cross platform and free as in beer. Our Powerpoint Presentation Blarg… If someone can convert this to pdf I will change this.